In a peaceful garden sanctuary, the luxurious rooms and suites of Sofitel Angkor Phokeethra Golf & Spa Resort offer inspiring views of the pool, tropical gardens or lakes. 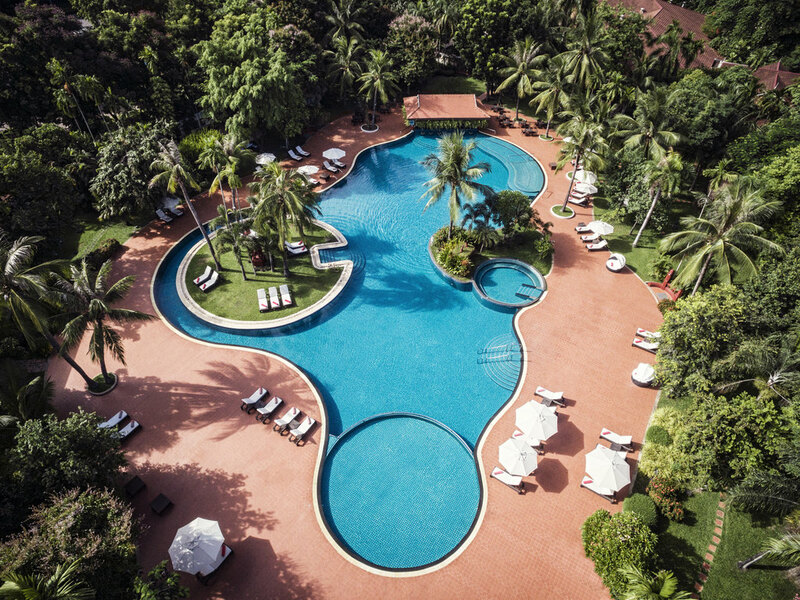 This 5-star hotel promises a memorable holiday for couples and families alike, with five restaurants and bars, the largest free-form pool in Cambodia and relaxing treatments by SoSpa with L'Occitane. Enjoy the world class 18-hole golf course, Phokeethra Club, managed by Sofitel, just 25-minutes from the Resort. 15 minutes away from the Siem Reap International Airport, Sofitel Angkor Phokeethra Golf and Spa Resort is easily accessible and well located at 5 minutes from Angkor Wat, the National Museum and Siem Reap city center, Pub Street. Luxury distinguishes our 238 rooms with 23 suites and Opera Suite are equipped with Sofitel's MyBed and internet access. Each spacious rooms are elegantly designed for your comfort, with scenic garden, lake or pool views and sophisticated amenities. REOPENING SEP '18 Step back in time in a veritable heaven of peace bordering on the Sala Lake, while indulging in a modern reinterpretation of French gastronomic cuisine by our Chef. Enjoy our wine flight or make a selection from our extensive wine list. Evokes a colonial-era atmosphere, is a popular place for an aperitif or post-dinner drinks. Sit back, relax and enjoy cocktails, spirits or a cigar. Our pianist plays everyone's favorite tunes, offering the perfect ambiance with a nice library. Your favorite snacks and dishes or enjoy a colourful cocktails at the swim-up bar. Located next to the free-form swimming pool, this is an idyllic place to snack whilst soaking up the sun or relaxing during your stay and with pool massages.